The No-Fail Plan to Beating Sugar Addiction! With one-third of our calories coming from sugar and white flour added to processed foods, sugar addiction is a rapidly growing epidemic. However, unlike other addictions, going "cold turkey" won't fix it. 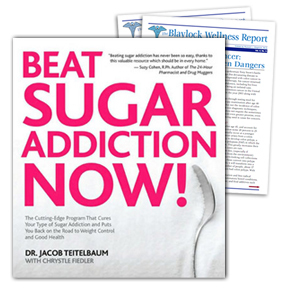 In this groundbreaking book, nationally recognized physician Dr. Jacob Teitelbaum uncovers four types of sugar addiction and gives a step-by-step plan for resolving their underlying causes, breaking sugar cravings forever, and achieving dramatically improved health and energy levels — while also making it easier to lose weight! Who can you turn to for alternative health and medical advice? Dr. Russell Blaylock, one of the nation’s leading nutrition experts. A former neurosurgeon, he edits the popular Blaylock Wellness Report. Remember, Dr. Russell L. Blaylock is a respected medical doctor who is unafraid to challenge establishment thinking. He doesn’t parrot what the New England Journal of Medicine — which receives heavy subsidies in advertisements — claims. IMPORTANT NOTE: Sales tax included where applicable. Your trial subscription comes with convenient automatic renewal. At the end of your subscription, we'll notify you. If you want to keep the publication, do nothing and we'll renew your subscription using your credit/debit card on file. We'll charge you $54.95 (or $49.95 for digital) for one year (12 issues) of The Blaylock Wellness Report and thereafter at the lowest rate then in effect. There is no risk, you can cancel within the first six months for a full refund of the unused portion of your subscription. With one-third of our calories coming from sugar and white flour added to processed foods, sugar addiction is a rapidly growing epidemic. Who can you turn to for alternative health and medical advice? His name is Dr. Russell Blaylock, a leading nutrition expert and neurosurgeon, who edit's Newsmax's Blaylock Wellness Report.